Have you ever been short on time and you just want to do the basic cleaning, the items you must do to keep you home clean and germ free. We have all been there when you need to decide what to clean and what you can leave for another day. However, if you know what you must keep clean, no questions asked, then you are able to make these decisions easier and based on germs rather than on gut feelings. Yourself, there is nothing worse than not taking care of you! You deserve to put yourself at the top of the list. The way you feel about yourself is important and if that means taking a shower with a toddler playing on the floor then do it! I know that it isn’t easy getting the ‘me’ time but it is important, you need to feel good about yourself and to put yourself first. Otherwise, your health will suffer and you won’t be able to do anything! It is a lesson that I find very difficult and it has taken me a long time to realize that I do need to put my needs first. If it is a question whether to take a shower or do the dishes you should choose the shower, you are just as important as the rest of your home. Your kitchen is important to keep clean, but there are areas that you want to pay more attention to than other areas. Your washing up cloth or sponge must get attention every single day, you must either wash it or sterilize it daily to prevent germs building up and spread around your kitchen and ultimately into your family, this can make them poorly. Your kitchen sink, this is where all the germs can end up after being washed out of the cloth, or dropped from a plate and you need to keep your sink clean, to get rid of the germs so they don’t have time to multiply. However, there is more to a clean sink than just the germ aspect, if your sink is clean and germ free it looks good and it will make you feel good every time you walk into the kitchen. Toothbrushes need cleaning, they are often just left out in the open and are breeding grounds for germs that are left on the brushes after use, or what lands on them during the course of the day. They need cleaning at least weekly; I put them into a beaker of boiling water at least once a week and wash out the toothbrush holder at least weekly too. You should replace your toothbrushes regularly too. Your toilet needs cleaning regularly to ensure that it is clean for your family to use and not exposing them to harmful germs and bacteria. I just wipe mine down daily with a couple of sheets of toilet paper and some cleaner, this keeps on top of the daily germs and then at least weekly I attack it to give it a deeper clean. Light switches and door handles, these are the objects that so many people touch and it is these touches that spread the germs quicker than anything else, keeping these clean is an essential task if you are looking for that important job, the one that needs cleaning to ensure your family’s health. 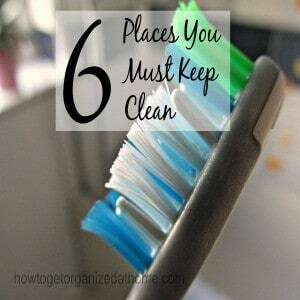 You might be surprised at my top places to keep clean, but they are all important and not overlooked. This is such a great list. I tend to only think of doors and light switches when someone is sick. Keyboard, mouse and phone should be done at the same time too! I just realised I totally forget about drawer handles – ick. I’m off to do them right now. I appreciate your nice short, efficient list of the highlights. Thanks for reminding us of these. I often overlook a few of these. Blessings to you from “Espressos of Faith” via #Mom2MomLinkUp! Good advice,it’s easy to forget things like toothbrushes. I remember reading somewhere once that a can opener is the most under washed item in the average kitchen so I do run mine through the dishwasher now and again just in case it is important! Great post, except that now I’m fairly convinced that all my family is going to die of diptheria within a week. When I used to clean houses we always got phones, light switches, and doorknobs. Thanks for posting. Hello from Totally Terrific Tuesday. Light switches and door handles are the worst brrr (and they are probably the most forgotten during cleaning).